I’m dreaming of enjoying Pasquetta in Italy and having a slice of this crescia al formaggio (Italian Easter cheese bread). There is nothing better than the scent of a homebred bread coming out of the oven, especially one that is filled with cheese! Crescia is a typical bread you will find in Le Marche and also in Umbria (it is also called Pizza di Pasqua or even Crescia Brusca). You will find it either baked as thin as a focaccia or really tall (made in a panettone pan). You may be wondering what is Pasquetta. Easter Sunday in Italian is called Pasqua, and Pasquetta is the Monday after Easter. They say in Italy, “Natale con i tuoi, Pasqua con chi vuoi.” Which means, “Christmas with your family, Easter with whomever you want.” Which should mean, there will be no Italian guilt trips if you decide on this lovely day to head off on a pic-nic with your BFF’s or with your BF or your GF. So it should be totally cool to tell your mother that you are not going to be joining her for lunch. It would have been better if her package had arrived the week before or even after Easter to just keep it simple. But I have to say, slices of salami and cheese and olives are what you eat with this gorgeous crescia! What do you eat on Pasquetta? Since you are going on a picnic with your friends and special people, you would be bringing a frittata, this bread, cheese, or even this casatiello. Typically a crescia is to be enjoyed on Easter. It is even baked a few days before Easter in some parts of Umbria and the local women bring their breads in baskets to the local small churches to have it blessed by the priest for Easter. Speaking of Italian guilt trips, I got one for you. Just the other day, the long awaited care package from Teresa finally arrived. She was sort of getting anxious as the weeks passed (we were on week 3)and I told her still no package. She told me I should go to the post office and inquire about it. And I told her I could, but I need a little info on this box. Perhaps a tracking number or something else that proves she sent the package. Imagine our delight that the day we finally got the tracking number, the package was left at our door! Teresa sends the best care packages and most of them involve something she’s made. In this package we got her latest salami that she made. Yep, Teresa is amazing! So she tucked into the box candies, some Italian snack cakes my son loves, her olives from Calabria, and her salami. I am sure everyone gets packages like that from their mother-in-law, no? Well, it arrived on Thursday and it had to go in the fridge to chill al little. Everyone was anxious to try it the next day. The next day, the guys were slicing it away and enjoying it with bread, her olives, chunks of cheese. At that same moment, my husband decided to call her and let his mamma know how amazing it all was. After a while, Teresa realized that they were eating meat on Good Friday. Gasp! She said in Calabrese, “Today of all days, son! It’s Good Friday!” There were some long sighs and some references to Jesus and I felt just awful, because I should have reminded him that it was Good Friday. It would have been better if her package had arrived the week before or even after Easter to just keep it simple. But I have to say, slices of salami and cheese and olives are what you eat with this gorgeous crescia! What do you eat on Pasquetta? Since you are going on a picnic with your friends and special people, you would be bringing a frittata, this bread, cheese, or even this casatiello. some notes on this recipe: This dough is really easy to put together. It is a yeast dough, but fear not! It’s worth taking a little time to wait for the yeast to proof and get this dough started. 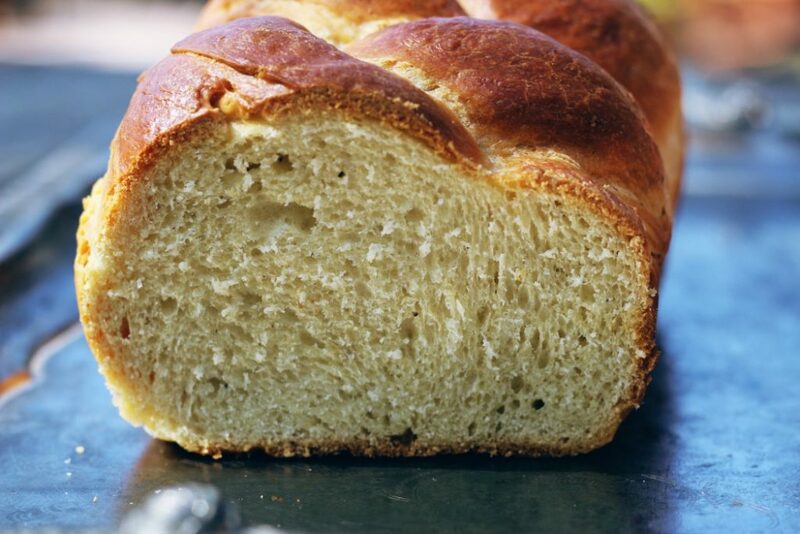 I love to make quick breads, but when I find the time, I will happily make a yeast bread. Trust me, I know this looks like there were no problems, and I have braided countless breads, but something threw me off in braiding this loaf. I had my 3 sections divided, but something wasn’t looking right in the loaf once it was braided. So I took the section apart and rolled them out again. I persisted until it looked right, and this dough was forgiving. I added grated Grana Padano and also Asiago. You could add grated Parimigiano Reggiano or Pecorino Romano. I liked the spicy touch of Asiago and I also added a little extra cracking of black pepper. All of the crescias I have seen are made in a panettone pan and are really high! I made this in a loaf pan following the recipe I found here. There is nothing better than the scent of a homebred bread coming out of the oven, especially one that is filled with cheese! Crescia al Formaggio-Italian Easter Cheese Bread is a typical bread you will find in Le Marche and also in Umbria around Easter time. In a mixer, with a dough hook attachment, add the warm water, yeast, and a teaspoon of the sugar. Mix until blended. Wait about five minutes, or until the yeast starts to activate. In a small bowl, combine the flour, salt, pepper and cheeses. Slowly mix in 1 cup of the flour mixture until combined. Mix in the eggs one at a time until they are combined. Add another 2 cups of the flour mixture, butter and salt. Mix together on medium-low speed stopping the machine to scrape down the sides of the bowl. Slowly add the rest of the flour and mix until combined. Stop the machine as you add each cup of the flour to scrape the sides of the bowl and incorporate the flour. Mix on low speed for 10 minutes until dough is incorporated. Be sure to give your mixer a break, as you don’t want to burn it out. Add flour if needed 1 tablespoon at a time. The dough will be a little sticky but also firm. Add the cheese, and beat until well combined. Take dough out of mixer bowl, form into a ball and coat with a light film of canola oil (or whatever oil you prefer). Oil or flour your hands. To make a traditional round loaf, form the dough into a ball, and place it in a greased pandoro (star) or panettone pan; a large souffle dish; or another round, deep pan. The pan should be about 6″ to 7″ wide, and 3″ to 4″ deep. To make a pretty loaf, divide the dough into three pieces; roll each piece into a 12″ log; and braid the logs. 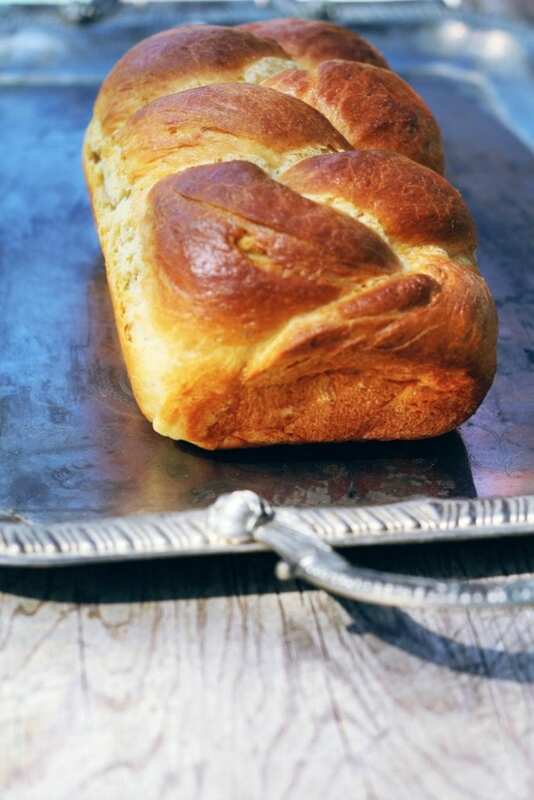 Nestle the braid into a lightly greased 9″ x 5″ loaf pan. Cover the loaf lightly, and allow it to rise for 1 hour (or longer, depending on the warmth of your kitchen, my loaf was ready to bake in one hour); the dough should have become noticeably puffy, though it won’t have doubled in size. To bake the bread: Put your oven rack in a lower position, just below the middle, and preheat the oven to 350°F. Bake for 35-40 minutes, until it’s a deep, golden brown and an instant-read thermometer inserted into the center registers 190°F. The braided loaf will require less time than the round loaf. Remove the bread from the oven, and let it cool in the pan for 5 minutes. 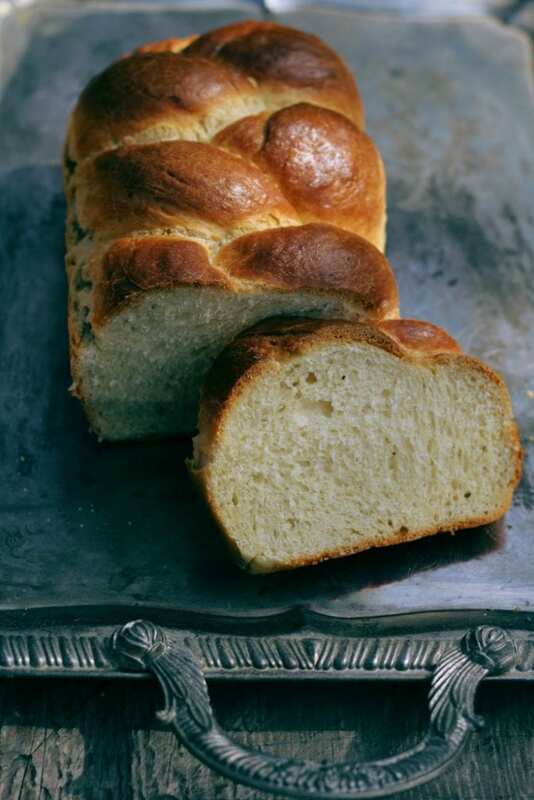 Use a knife to loosen the edges, if necessary, and turn the loaf out onto a rack to cool completely before slicing. The directions call for sugar but sugar isn't shown in the ingredient list. I haven't seen sugar in any recipe for this bread, so I'm curious.